Unit is a caster portable design for indoor use with a 2,500# lifting capacity, 51” discharge height, 135° rotational arc. Unit has a 52” wide x 42” deep bucket to accept containers up to 50″ wide loaded at floor level. All carbon steel construction with a 304 stainless steel product contact liner in bucket. Unit includes a five (5) position, 304 stainless steel, adjustable height retainer bar to prevent excessive movement of the container during the dump cycle. Rotation of the bucket is stopped at 45° past horizontal by a limit switch. Unit includes a Hoffman NEMA 4 enclosure with momentary contact controls. Unit painted with Steel-It™ USDA/FDA approved 316L stainless steel pigmented epoxy system. 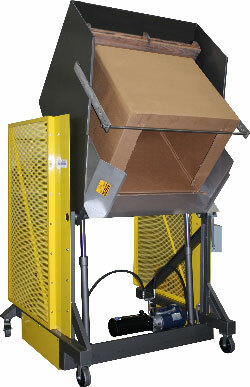 Unit includes flattened expanded metal safety guarding on two (2) sides of the equipment to an 84″ level.